Customized shape, size (in mm), weight per stone, quantity, total carat weight. Color, Clarity, Setting for the Diamond. Weight per stone on the basis of size. Different diamond vendor for each different type of diamond. Define Vendor Specific Diamond Price, Setting Price and Diamond Handling Cost at one place and automatically brings in these things in Style BOM. Define weight per stone to calculate total carat or vice versa e.g. define total carat weight to calculate weight per stone. Diamond Price depends on Vendor, Shape, Weight per Stone, Color, Clarity, Natts, Certification and Diamond Quality. If any of these changes, then Diaspark ERP brings diamond price automatically from vendor specific costing. Diamond setting price on the basis of Style Vendor. Setting price depends on Style Vendor, Setting Type, Diamond Shape, Weight/Size per stone and Metal Type. Diamond Handling Cost depends on Style Vendor, Diamond Supplier, Price per Carat or Weight per Stone and Shape of Diamond. Diaspark ERP brings handling cost from vendor specific costing based on these parameters. Define Stone Type, Shape, Size (in mm), Weight per Stone, Quantity, Total Carat Weight, Color, Clarity and Setting for the Colorstone. Diaspark ERP defines weight per stone on the basis of size. Define Vendor Specific Colorstone Price, Setting Price and Handling Cost at one place and Diaspark ERP automatically updates them in Style BOM. Colorstone Price depends on Vendor, Stone Type, Shape, Weight per Stone, Color, Clarity, Cut, and Stone Quality. If any of these changes then Diaspark ERP pulls Colorstone price automatically from vendor specific costing. Colorstone setting price depends on Style Vendor. Setting price depends on Style Vendor, Setting Type, Stone Type, Stone Shape, Weight/Size per Stone and Metal Type. Handling Cost depends on Style Vendor, Stone Supplier, Price per Carat or Weight per Stone and Shape of Stone. Diaspark ERP brings handling cost from vendor specific costing based on these parameters. Casting unit as GM or DWT (Penny Weight). Customized metal types, metal colors and its costing calculation e.g. Silver+1/2 Platinum and Silver 0.925. 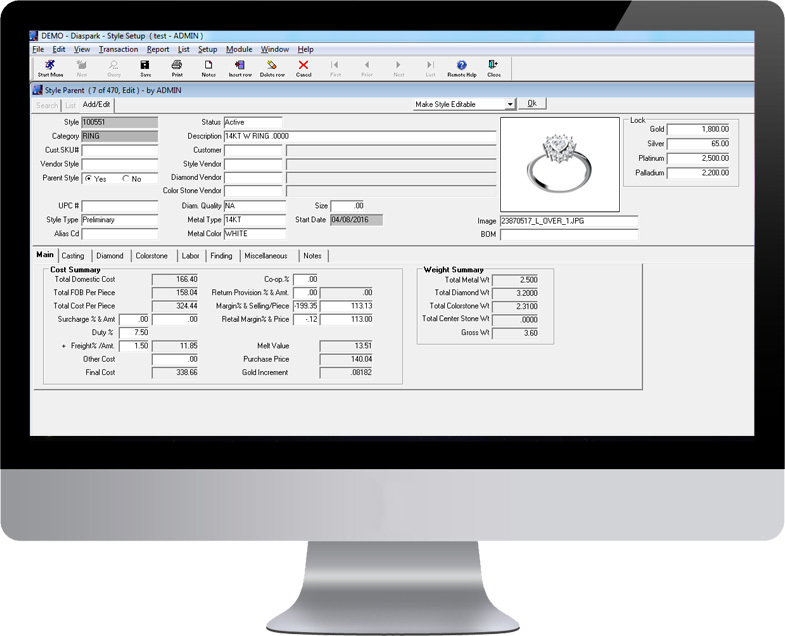 Vendor Specific Metal Markup percent, Metal Surcharge Amount, Surcharge Percent, Casting Labor for gold/silver/platinum/palladium at one place and Diaspark ERP will calculate casting price as per these parameters from taking vendor specific things into account. Define Metal Loss % and Alloy for the style to calculate metal price accordingly. Define Finding Vendor and its details viz. cost per pieces, gold increment, increment per dollar or per 10 dollar, and finding weight at one place. Finding Price Calculation depends on gold lock defined in style BOM, gold increment defined in finding master, increment per dollar or per 10 dollar. Define Overseas and Domestic Labor separately. Define Vendor Specific Labor with parameters like Style Category, Metal Type, Metal Weight and Labor Type at one place. Diaspark ERP brings other labor costs on the basis of Style Vendor, Style Category, Metal Type, Metal Weight and Labor Type. Style Costing depends on Metal, Diamond, Colorstone, Finding, Labor, Duty, Surcharge and other costs. FOB Cost calculation is done on the basis of duty, supplier and setter. Domestic Cost calculation is done on the basis of supplier. Duty depends on FOB cost only. Other cost does not depend on any cost. Define Customer Co-op percent in Customer Master to calculate selling price depending on the customer. Gold Increment calculation can be automatic or manual. Customized Return Provision on the basis of Selling Price or Melting Price. Define whether to calculate selling price or margin or markup whenever there is change in cost of the style. Customize behavior of Margin as Markup. Update metal and finding cost in style depending on the increased meta lock. Update Diamond Cost in style depending on the increased diamond prices, setting cost and handling percent. Update Colorstone Cost in style depending on the increased colorstone price, setting cost and handling cost. Update all cost at one click. Choose whether to calculate Selling Price/Margin or Markup in global update. 3 step validation to ensure correct update. First validate style and get list of styles with existing costs and costs after update. Select styles depending on various parameters e.g. casting labor % increase, setting cost % increase, diamond cost % increase etc. Select Styles and then update them. Log of the global update to check who runs global update and when. Saves complete statistics.